359, Hubcap, 14", 70-72, PLYMOUTH, BARRACUDA, PASSENGER, CHROME OUTER RING, MACHINED DOMES CENTER NO CENTER LOGO, WORD PLYMOUTH DIVISION IN BLACK ON OUTER EDGE OF CENTER, 28 HOLE TYPE. PAINTED BLACK IN EACH TEAR DROP HOLES, METAL CLIPS. 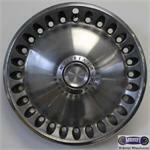 375, HUBCAP USED, 14", 73-74, PLYMOUTH, BARRACUDA, PASSENGER, CHROME OUTER RING, 28 HOLE TYPE. 5 PAINTED BLACK RINGS & DOMED CENTER WITH ENGRAVED WORD PLYMOUTH DIVISION ON OUTER EDGE & BLACK CENTER, METAL CLIPS.